If you’re looking for insulated packaging that can be re-used and recycled then Woolcool is for you. Our natural materials help you, your end-users and the environment… it’s all good. Need a bespoke packaging solution? We specially designed a standard range of Woolcool insulated packaging for direct deliveries of a whole host of chilled and frozen foods including meat boxes, fresh fish and seafood, cheeses and deli items, fresh fruit and veg, gourmet menus and ready meals. Of course, Woolcool keeps products warm too! Woolcool already supply tailored made solutions to many of the leading names in the food sector including John Lewis, Innocent, Gousto, Abel and Cole, Unilever and Riverford Organic. Fortnum & Mason use our Woolcool pouches to protect chilled products in their world famous hampers. Woolcool insulated liners combined with rigid, recycled, flat packed, brown cardboard boxes make-up the complete Woolcool solution. Alternative colour and branding options are available. Woolcool pouches are ideal for sending one or two speciality food items in the post or within an ambient food box or hamper. 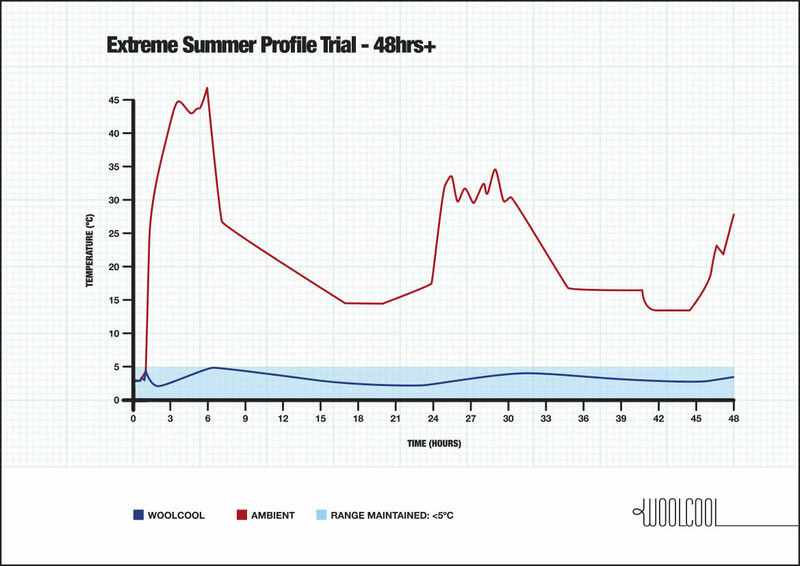 Alternatively, Woolcool postal packs are available in A3 or A4 size or long enough to fit a whole salmon. Both products are made from white recyclable LDPE with an extra secure 15mm self-adhesive strip. Woolcool pouches are also available with clip-together handles as ready-to-go cool bags. 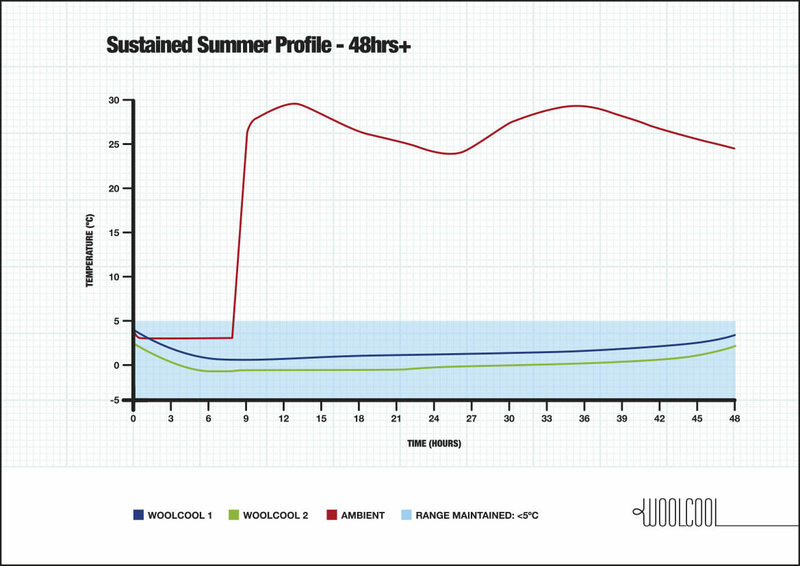 Rigorous testing to industry standards in our own environmental chambers supported by independent trials consistently proves that Woolcool insulated packaging maintains food contents at their required temperature for longer than conventional materials. 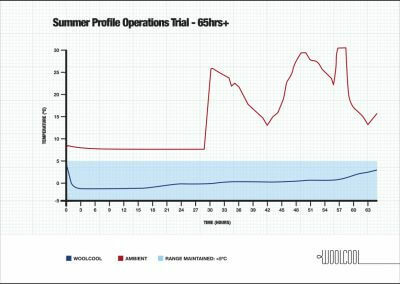 Woolcool works for frozen produce too. Superior insulation means fewer ice packs are necessary, making Woolcool pouches ideal for inclusion in ambient hampers and for individual, speciality food deliveries. Woolcool insulation is sealed in breathable film which allows the ‘smart’ wool fibres to absorb humidity and condensation. Woolcool insulation snugly cushions food contents to prevent damage in transit, without additional void packaging. High performing quality product, from a fully traceable UK based supply chain. Genuinely Sustainable Packaging without sacrificing performance. Woolcool is supplied flat packed and therefore reduction in storage space needed. Tried, tested and proven performance across both the Food and Pharmaceutical Sectors. ISO 9001 and 14001 certified company. Trained and experienced packaging technologists on hand to help with all packaging questions. Wool is one of the most sustainable natural materials, being available in abundance as a by-product of rearing sheep. 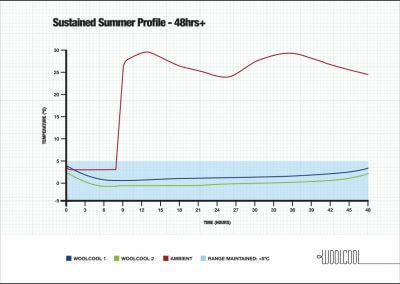 Woolcool offers significant benefits for complying with UK government and EU requirements, including the European Commission’s guidelines for the distribution of perishable products, Packaging Essential Requirement Regulations, Producer Responsibility Obligations (Packaging Waste) and businesses’ Duty of Care. Since 2009, many thousands of tonnes of non-biodegradable plastic packaging waste has been saved from landfill by UK customers switching to Woolcool. Just in the last year alone, Woolcool has prevented the equivalent of 75 Olympic sized swimming pools full of polystyrene from going to landfill. Woolcool is delivered flat packed. This offers massive logistical and transportation benefits for businesses and the environment. Woolcool can be delivered in just 1 x 40ft lorry versus the like for like sizing on 4x40ft lorries in equivalent conventional solutions. A 75% space saving! Woolcool insulated packaging products help companies and consumers reduce, re-used and recycle packaging as set out by the Government and following guidelines by WRAP (Waste & Resource Action Programme). The wool insulation is totally compostable and biodegradable, releasing valuable nitrates back into the soil. Any plastics used are easily recyclable at local authority waste depots. The cardboard delivery boxes are produced using recycled materials with FSC standards, and are easily recyclable at local authority waste depots. 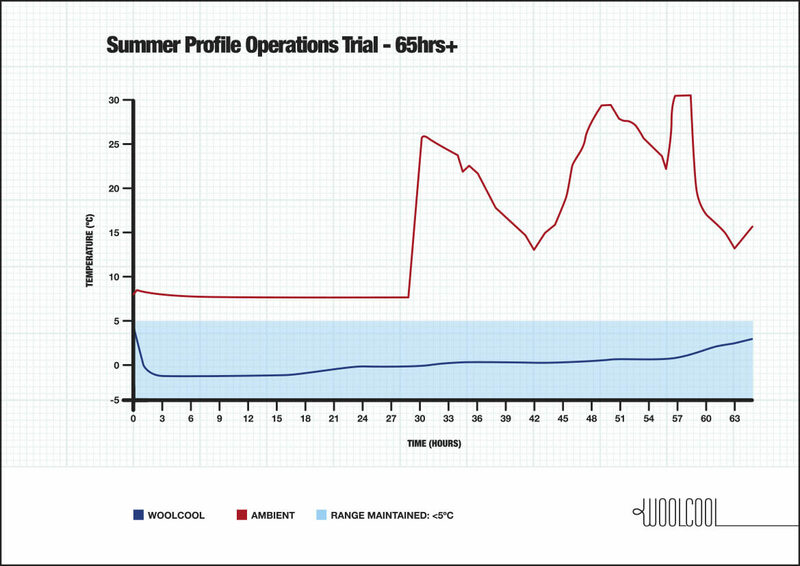 Using Woolcool significantly reduces the rate of the Packaging Waste obligation versus conventional materials. At the end of its useful life as packaging, the insulation liners or felted wool can be re-used for a variety of purposes. Woolcool’s sustainable credentials contribute towards our customer’s Corporate Social Responsibilities and Sustainable Development Goals. Woolcool will not only stand the test of time but brings businesses the added value of being environmentally responsible. Please complete the short enquiry form and one of our team will call you back. Woolcool insulation is made using 100% pure sheep’s wool. The Wool is sustainable, compostable, and due to Wool’s superior insulative properties, more effective than other solutions at keeping contents consistently colder for longer. This biodegradability means that at the end of the liner’s life, the Wool component can be returned to the soil, where it decomposes, releasing valuable nutrients into the ground. Regardless of where the liner ends up, even if ultimately this is in landfill, within 6-12 months, the Wool will have broken down, never to be seen again. Not only is the Wool reducing food waste by keeping food chilled in transit, but it is also significantly reducing our packaging waste to landfill. We are open to any other suggestions too! We are also new and inventive ways. Post these on social media using #letsboxclever. If you aren’t looking to re-use the Woolcool Liners, simply remove the plastic liner, this can be put in with the standard plastic recycling, then just put the wool liner into either a compost bin (if available) or dig into the soil in the garden, as the wool will release valuable nitrates back into the soil as it breaks down. Some local authorities will accept the wool in household garden waste bins, it is just a matter of checking with the local council to find out what recycling facilities are available in your area. Even if the wool going into the general waste, it will break down in landfill. We only use 100% sheep wool. As an ethical and environmentally responsible business, we are very sensitive to the welfare of animals and in particular sheep, from which our amazing, sustainable insulated packaging material is made. We have a lot to thank the Sheep for! Adult Sheep of breeds which have continuously growing wool need to be sheared for welfare reasons, a heavy fleece not only causes a sheep to over heat in the summer but can provide an ideal environment for parasites on the sheep. The RSPCA advise that a sheep must be shorn at least once every year for their own health, to keep them comfortable and free from parasites. Shearing can only be carried out by a licensed shearer to ensure that the sheep is handled carefully. We do not use pulled wool. After being sheared, all of our Wool is washed and scoured in the UK to ISO standard. All wool sourced is heat treated and no harsh cleaning chemicals are used. The wool goes through a series of hot baths where it is washed and scoured using only hot water and a mild detergent. It then goes through industrial dryers. This process means our wool is both clean and suitable to use with food and pharmaceutical products and does not carry any nasty chemicals! Questions around the smell are usually linked to worries about cleanliness and linking the smell to the toxins etc. Wool is washed and scoured to ISO standards to ensure cleanliness. We perform monthly tests to ensure it is completely clean and free of any toxins that can leach into food/pharmaceuticals. As with any material/object, man made or natural, it has its own smell. Typically if the Wool has been stored with other wool, it will smell stronger, but once it has been taken out of the initial delivery box, that smell will dissipate. To remove the smell we would have to add chemicals, which would negate our natural product and could potential damage the fibres. Of course, we love the smell, as what better way is there to prove our product is 100% natural?! WHAT IS WOOLCOOL INSULATION MADE OF? 100% felted sheep’s wool, sealed within recyclable food grade polyethylene wrap. Sheep’s fleeces are naturally washed, scoured and felted to make the insulation material to the required thickness which is then cut into strips and sealed within a recyclable polyethylene food-grade wrap. 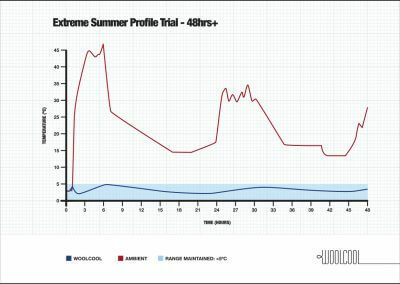 HOW LONG WILL WOOLCOOL KEEP THINGS COOL? 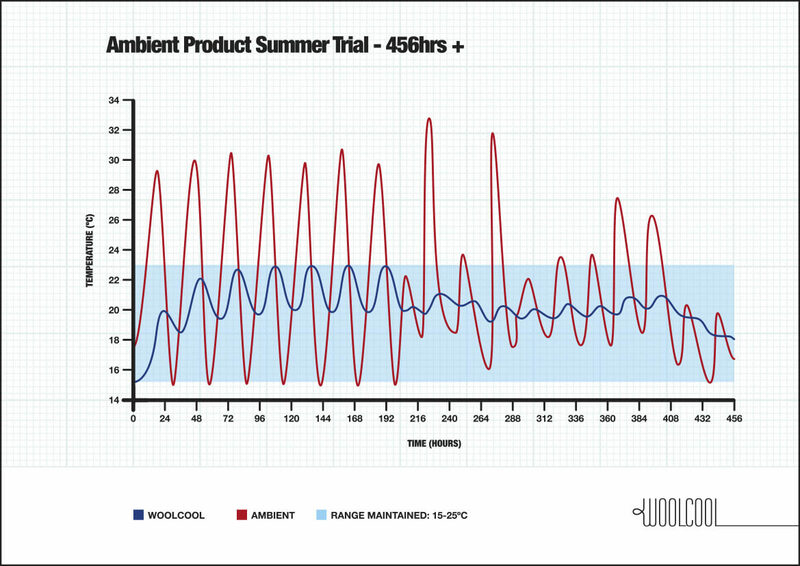 With ice sheets used to establish the cool temperatures for packaging foodstuffs, the Woolcool insulation has been proven to keep contents packed at 1°c, chilled below 5°c for at least 24 hours. HOW MANY ICE-SHEETS WILL I NEED? 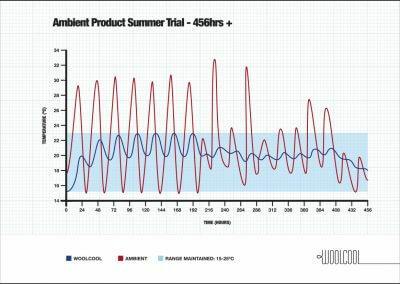 Woolcool does need ice packs, although the efficiency of the wool liners means they need significantly less than the alternatives. Please contact us to discuss your particular application. DOES WOOL KEEP PRODUCTS WARM? Yes, wool is excellent at maintaining temperature and has been tested for ambient and warm applications. Yes, wool is perfectly safe. The natural washing and scouring process requires no chemicals, additives or further sterilisation. Wool fibres have been scientifically proven to absorb and lock-in bacteria and dangerous chemicals. The wool is sealed within recyclable, food grade polyethylene wrap to prevent the fibres coming into direct contact with packaged contents. DOES THE WOOL SMELL OR TAINT FOODSTUFFS? No. After the natural washing and scouring process, the wool only has a similar smell to a new, pure wool jumper! It is also sealed within recyclable, food grade polyethylene wrap to prevent contents coming into direct contact with the wool fibres. HOW MANY TIMES CAN WOOLCOOL BE RE-USED? This depends on the condition of the Woolcool after use, for example whether it has been ripped or if contents have spilled out or seeped into the insulation. If the Woolcool cannot be re-used as it is, the wool can be recycled and re-used or put to many good uses from lagging pipes to insulating garden plants from the frost! The wool is sustainable, recyclable, compostable and biodegradable. The food grade wrap is also recyclable.